This year I’m sewing along with Gertie from Gertie’s New Blog for Better Sewing. A bunch of other talented seamsters and I have joined up through the Craftsy online community to make her Starlet Suit. Here’s a reflection on my efforts to sew well. The muslin came together pretty quickly this week. 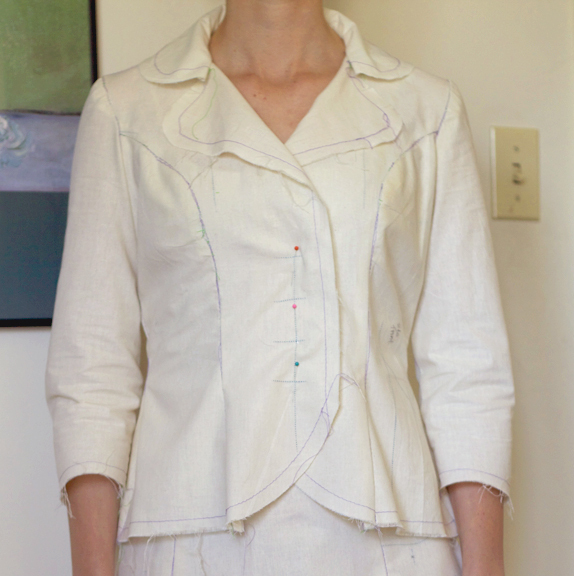 The pattern only comes with written instructions for the skirt, not for the jacket, but it was simple enough to stitch neighboring pieces together. This time I used green thread and long machine stitches to contrast with the purple thread I used for my tread tracing. In these weekly posts, I tend to only post a quick image of my progress and a brief description of my experiences. Since fitting is not covered in the class, I’ve added more photos of the muslin below in the hopes of getting some input from all of you as to where I might need to direct my attention. First, the easy fit: the skirt. I think the skirt fits well, but it does need an extra half an inch at the waist. I expected I might need to add width here since the pattern size I cut had a waist measurement an inch smaller than mine. 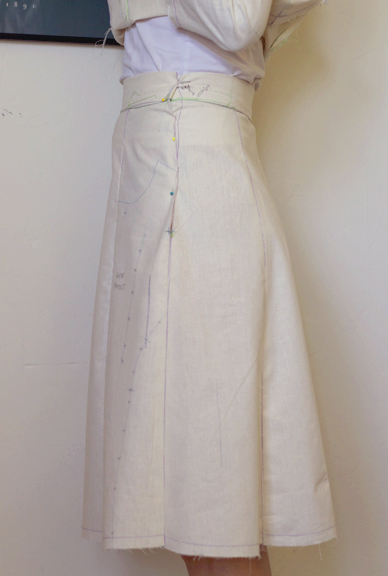 My plan is to add roughly 1/16″ to the top of both side seams on each of the six skirt pattern pieces, tapering down to nothing a couple inches below the waistband seam. Also, though the instructions for the waistband suggest that it should have an inch underlap, I don’t think it was drafted with this underlap included since it fit the skirt pieces exactly as is. Therefore, I plan to add an inch and 3/4 to the waistband to account for both the extra needed for me and for the underlap. Now to the jacket. I had a little bit of trouble getting the side front to match with the front since the side front was much longer than I expected. I double checked to make sure I cut the correct side front piece since I’d noted earlier that this particular pattern piece was mislabeled. I had. 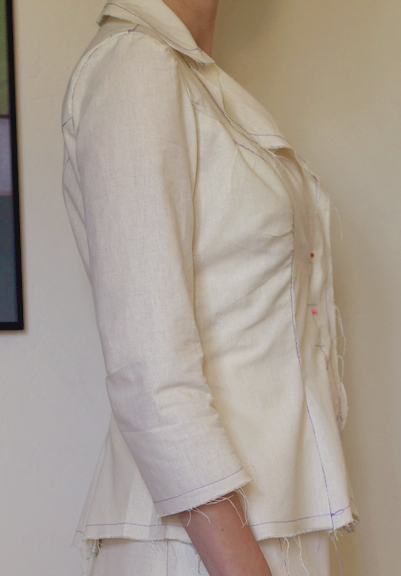 I matched the notches along the princess seam and the stitching lines at both the armhole and the hem. I gently eased everything in from there. Later in the week when I was watching one of the class videos, I noticed that Gertie only matched the notches along the princess seam and eased between them. She did not ease anywhere else, and since she hadn’t marked her stitching lines to begin with, she definitely did not worry about matching any stitching lines or even edges at either the armhole or the hem. Since I think my muslin looks like there is a lot of extra fabric in the front side pieces, I plan to try stitching the pattern pieces together just as she did in my next muslin. 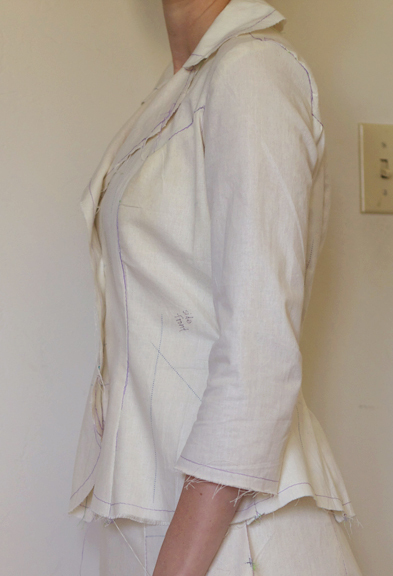 As is true for almost every pattern I make, the waist is too high for me. I plan to lower it an inch. I’m also planning to add a half an inch to it since the skirt suggested extra width was needed here. Also, the neck feels a bit high in the back. It’s hard to see since my self-photography didn’t catch it. Is it high on purpose? Would lowering the back neck seam alter the roll of the collar? I’m not sure if the pulling and gathering along the princess seams in these side shots would be reduced by sewing those seams without the extra easing, as I discussed above. What about the area where the front meets the sleeves? And the sleeves themselves? My experience is definitely lacking in how to know whether sleeves properly fit. I think these seem to hang just fine, but I wasn’t quite happy with how they set in around the back double notches, which are just behind the underarm. You can see the issue better in the image below. There are puckers on both sides right where the double notches are located. When I set in the sleeve, I matched the notches on the front and back, the bottom sleeve seam with the jacket side seam, and the notch on the top of the sleeve with the seam on the top of the jacket. I eased the sleeve in as necessary. I haven’t had a chance to watch any of the class videos on setting in these sleeves, so perhaps Gertie uses some trick here that I don’t yet know. The jacket does seem to have a wee bit of extra fullness in the back princess seams, but perhaps that’s due either to the same extra easing issue that I had in the front or to the fact that the waist is snug, which makes the ease in the back appear fuller than it actually is. My homework for this week is to watch the rest of the class videos so that I know that I’ve sewn the muslin together the right way. 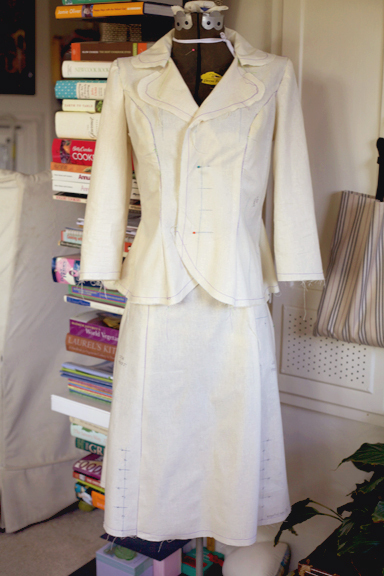 I’m then going to reconstruct the muslin, sewing each seam just as Gertie does and adding the extra length and width to the waist. If you have any suggestions for me as to how to best fit this muslin, please let me know. Thanks! 1. there is too much fabric around the bust, so you might want to consider to reduce the circumference around the bust line (probably at the side seams because the princess seams look great). 2. I can’t tell with this pics, but it looks like the armhole is too low. Maybe you can measure the circumference of the armhole on your favorite jacket and compare to this one. I’m using a nice linen, wool blend. It’s substantial but not too thick. I should get it in the mail any day now… Also, we’ll see how the bust fits once I restitch those front seams a la Gertie. It looks great! Way to go! 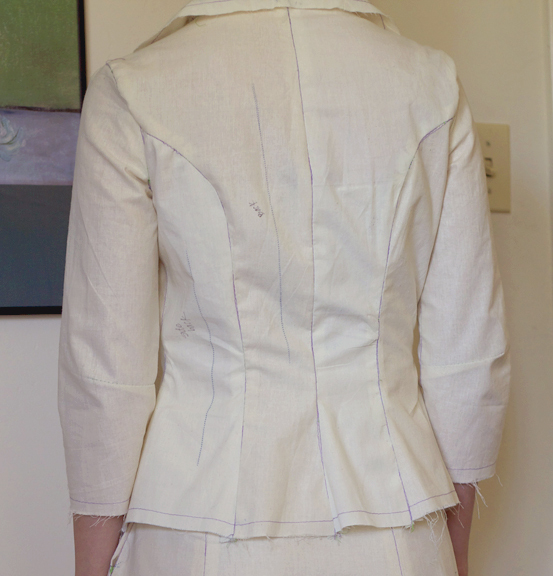 Fitting is such a tricky little devil… I think I might pinch out just a tad bit of fullness from the princess seams – particularly in the back – or try pinching in the side seams like Roni-Ofec suggests and see if that pulls the area around your bust line/back smoother. A tell tale sign that the armhole is too low is a lack of mobility in the jacket. When you raise your arm – does the whole jacket swing up with it? If that area is uncomfortable then yes, maybe take a look at a RTW jacket and size up the armhole. If its not uncomfortable than I wouldn’t mess with it. Good Luck – Keep up the good work! Thanks! We’ll see about the armhole and princess seams when I sew up the jacket again ignoring the stitching lines on the side front pieces. Hopefully it’ll eliminate a bit of that excess fabric in the front. Hi Amy, the outfit will look great on you, retro yet modern. Here are a couple of suggestions, I wish I could see it in person on you! I think the upper back is too tight, (even though the waist etc. are too big) so that is pulling the sleeve upper back across the top of the arm and causing those ripples where the back princess seam meets the sleeve. The seam of the sleeve should be a bit further out, then the sleeve will hang properly. Are you a bit broad-shouldered? that can cause these ripples. or maybe you need a bit more room across the upper sleeve. Sometimes a garment requires an addition in one place but then a subtraction in another spot that seem to contradict, but work out for fit. The jacket neck looks right to me. I don’t think the armhole looks too low but it is hard to tell in the photo. You are on the tall side, so I am sure the jacket could use more length in the waist. Thanks Beth. The jacket is definitely too small across the back. After seeing Shams’ photo of her jacket muslin in which she held her arms forward, I tried the same, and it was really strained. I’ll try to set the sleeves farther out and see what that does. I’m also not sure I sewed the back pieces together correctly (again, none of the pieces seem to match up as well as I would expect), so trying again after watching how Gertie manipulates the pattern may help. I’m also definitely lowering the waist. Next Tuesday I hope to have another round of photos up. Are there other positions I should look at to judge fit? Arms out? Maybe I’ll wear the muslin to the Gaultier exhibit when I see you next!